With funding from Offaly County Council, BirdWatch Ireland is undertaking a whole county Swift nest site survey. The objective of the survey is to establish detailed results on the presents of Swifts in the county and the location of nesting colonies. The engagement of Tidy Towns and residents as part of this survey is fundamental to this project for many reasons including the principal that, increased awareness leads to increased consideration (protection) and we are already seeing the results in Offaly! 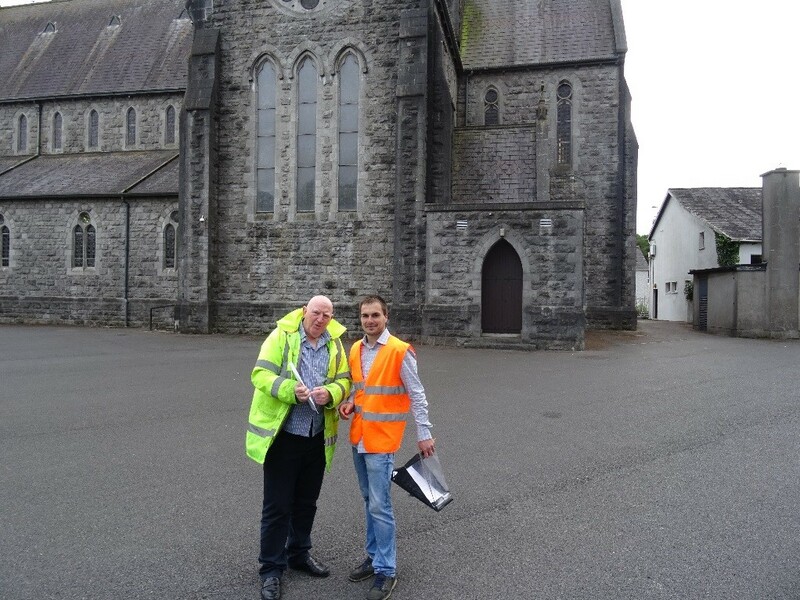 With our enthusiastic and dedicated Fieldworker “Anton” on the case we had no fear that county Offaly would be forensically searched for Swifts. (AK) Тhe first week of Swift surveying was over at blink of an eye, the focus was to survey the smaller towns and villages of the county. The county it seems is a mixed bag for Swift distribution, unfortunately, empty skies and silent streets greeted us at many of survey areas. Thankfully it wasn’t to be all doom and good strong colonies were also observed dispersed throughout the county boundaries. 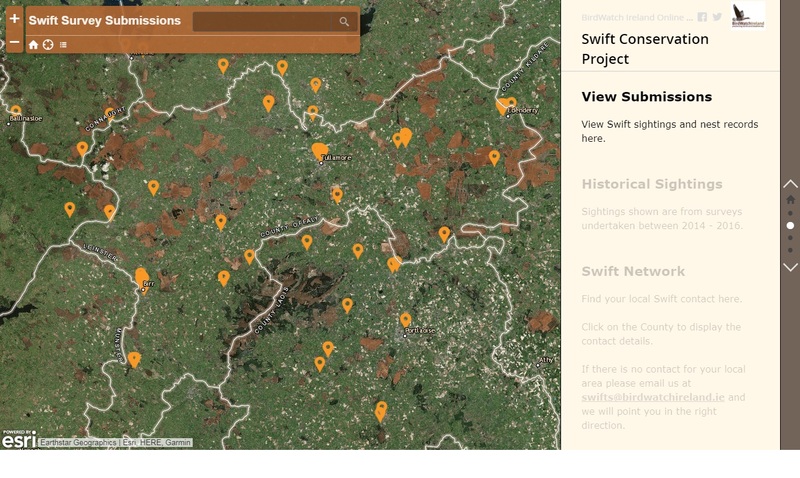 The second week of Swift surveying began with a concentrated effort on priority areas (Large towns with known Swift abundance) like Birr, Edenderry, Clara, Shinrone, and others. We got together in the evenings to survey these locations with active local groups who were interested in surveying their own localities for Swifts and we were delighted to introduce them to the species and survey methods whilst drawing on the rich local knowledge held by the groups members. 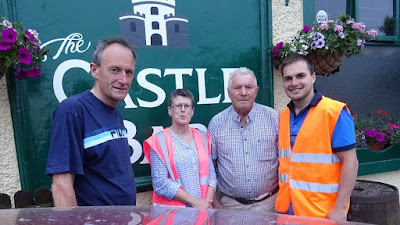 During week two of surveying we happened across Edenderry Tidy Towns whom were carrying their duties around the town. Their interest towards wildlife ensured a good link for future cooperation. One of the evenings during that week we surveyed the whole town for Swifts. Special thanks to Frank Hardy and Willie McCreanor for availing their time to carryout survey work. Shinrone Tidy Towns have enthusiastically accommodated a meeting and their interest promises secure future for the Swifts inhabiting their area. During the visit in Shinrone we went for quick cup of tea, until a shower of rain passed. This gave us an opportunity to get to talk on different themes and spontaneously one of the members of Tidy Towns mentioned that he has a painting and a poem about Swifts in Shinrone. This immediately settled us down for another cup of tea and a pint of Guinness for Henry, who began reading the poem. It was fascinating to find out the buildings present in his painting are the same buildings which hold the largest part of the population of Swifts in Shinrone. 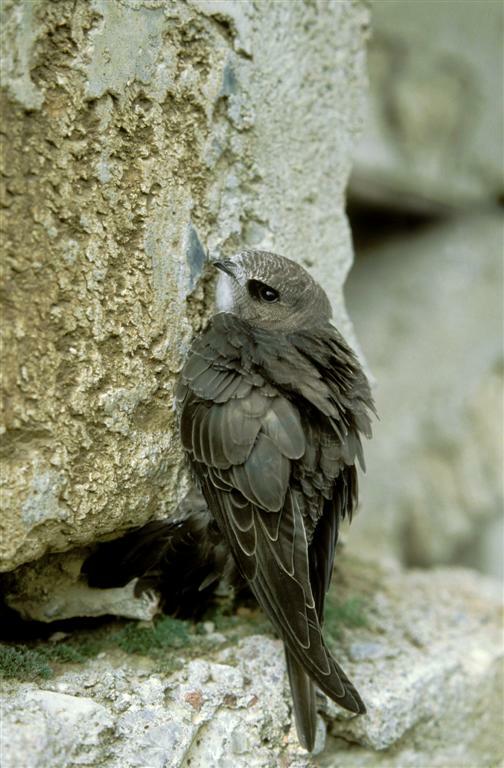 In Clara it was found that Swifts rely on two buildings for nesting. However, the likelihood is that these building will change or be modified makes the local population vulnerable. We needed to see if there may be more Swifts present somewhere else that we were unaware of. We got in contact with Clara Tidy Towns and since meeting up, Tim and the gang are on the case combing the town for new colonies yet to be recorded. 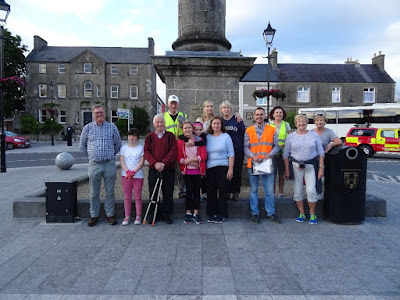 Week three of surveying came and went and we met with Birr and Clonbullogue Tidy Towns groups and have robust monitoring schedules in place and lots of new enthusiastic Citizen Scientists. Heavy rainfall dampened survey efforts at the end of week 3 and with week 4 and 5 now behind us there are colonies being logged all over the county. Standby for a 2017 County Offaly Swift Survey update soon! 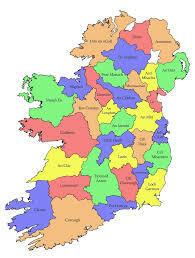 Thanks to all the local Tidy Towns groups, residents and volunteers who have made the survey such a success to date. Thanks to Amanda Pedlow Offaly Heritage Officer for her help and enthusiasm in getting this project up and running. It’s very heartening to see local communities come together to protect their rich natural heritage. We will continue our work and liaison with local groups over the coming weeks.